Where's Baby? Look before you lock! TIME LAPSE - Slide the tab to change the temp. Leave a Reminder in the Back Seat! Although it might be hard to understand how this can happen, most parents who leave their children behind simply forgot. In most of these tragedies, parents became distracted. They were distracted because they were thinking about work issues, or simply fell into a daily routine that, on a usual day, did not involve responsibility for a young child. If you make it a habit to leave your phone (or, some other item) in the back seat area every time that you buckle your child into their seat, you will be giving yourself some added insurance against the unthinkable. An average of 38 children have died in hot cars each year in the USA since 1998. Since 1998, more than 700 children have died in vehicles from heat stroke in the USA. More than 70% of heat stroke deaths occur in children younger than age 2. More than half of heat stroke deaths occur because a caregiver forgot the child in the car. Roughly 30% of heat stroke deaths occur because the child got in the car without a caregiver knowing and couldn't get out. Nearly 20% of deaths occur because a caregiver intentionally left the child in the car. Cars heat up quickly. A vehicle can heat up 20 degrees in 10 minutes. Cracking the windows or not parking in direct sunlight does not make a car significantly cooler. Heat stroke deaths have occurred even when the vehicle was parked in shade. A car can reach 110 degrees when temperatures are only in the 60s. Heat stroke can take place when the outside temperature is as low as 57 degrees. The body temperatures of children can increase three to five times faster than adults. Heat stroke begins when the body passes 104 degrees. Reaching an internal temperature of 107 degrees can be deadly. Never leave a child alone in a motor vehicle. Make a habit of checking your back seat. When strapping a child into a car seat, leave a reminder like a cell phone or even your left shoe in back with them. 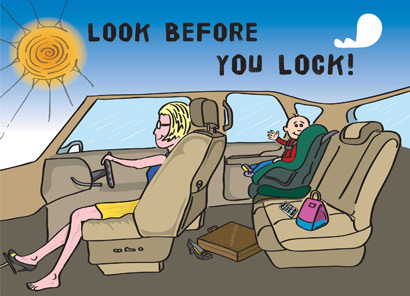 If you see a child unattended in a vehicle, call 911. After parking your car, lock it. Children who get inside an unlocked vehicle can become trapped.